Do you need to create a price list? with free custom Price List Templates for your retail, service and wholesale business. No design expertise required. Why do you need a price list? In essense, a price list gives your customers a clear picture of what products your business is selling and what price you charge. 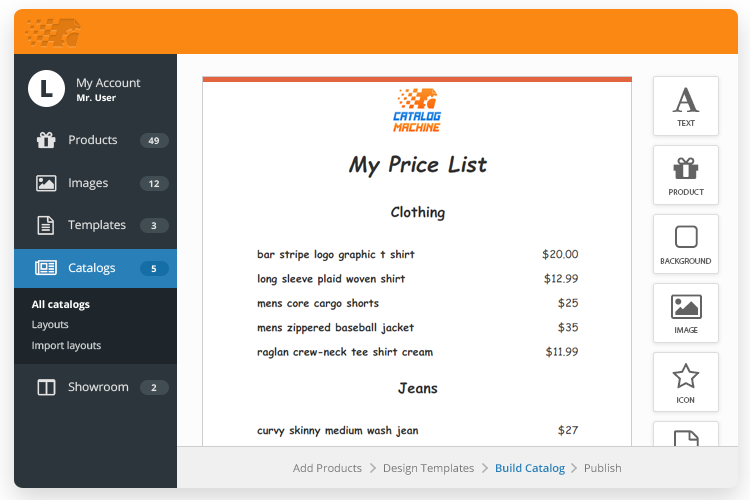 You can add pricing templates to your product catalogs to provide quick overview for your product lists. With the Catalog Machine app you can create a professional price list template without investing in a design agency or spending too much of your valuable time. Price list templates can be saved with Catalog Machine, used and shared season or year after year to create and update your new product selection quickly, making creating price lists an efficient and productive part of your product sales and marketing. Price list templates can also be handy if you need to present alternative price list to each customer or groups of customers. A price list includes item number, description, picture, prices with optional inventory and quantity fields. 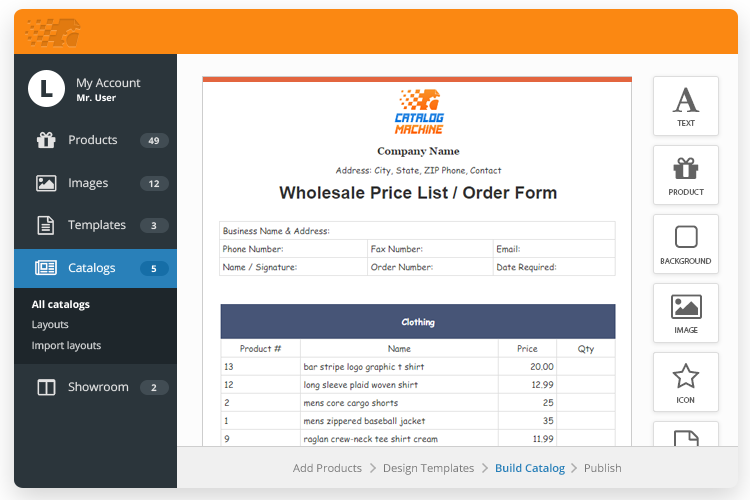 Use product price sheets as price quote templates and include Order Form to get orders immediately. You can create multiple price lists for your different customer tiers, regions or sales channels. Maintain separate price lists for different product lines, niches and target events. Promoting your products in a price list design template, that is, highlighting or featuring some hand-picked or popular sellers with “new” or “bestselling” headlines may help direct sales where they are most desired. Simple price list templates should have a simple linear structure and include visually clean product shots (not scene or lifestyle shots) to highlight product's appeal. Don’t forget a call to action, and to direct buyers to what they need to do next so you don’t lose them to indecision. Make sure to include your contact information and order form. Import products and images from Etsy, Shopify, eBay, Magento or CSV with one click and manage your own product database. Create Wholesale, Retail, Salon and other price lists for your products and services. PDF & mobile-friendly HTML. Privacy levels and password protection. Build customized price lists with advanced templates for individual markets, customers and events. Share your product price lists online, social media, send in email or download. Optimized for Google and Facebook. Embed your product Online or PDF price list into your website pages customizing visual options. Advanced text editing, image management and design elements for you own custom content and product information. 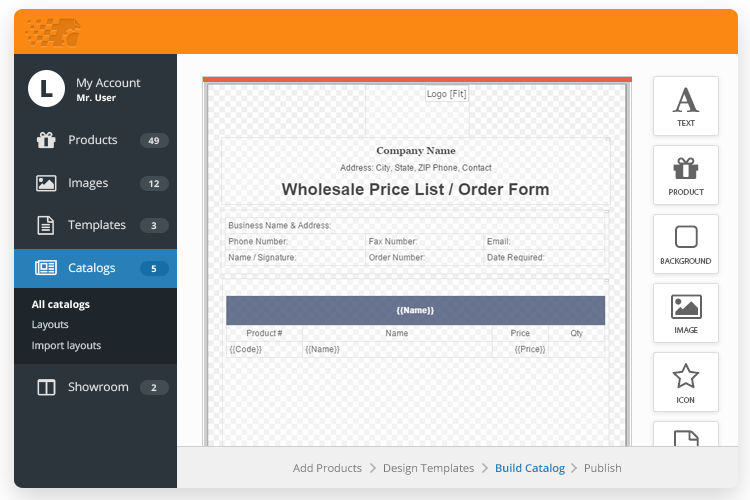 Include pre-built Product Order Form or receive customer order requests directly from a price list. 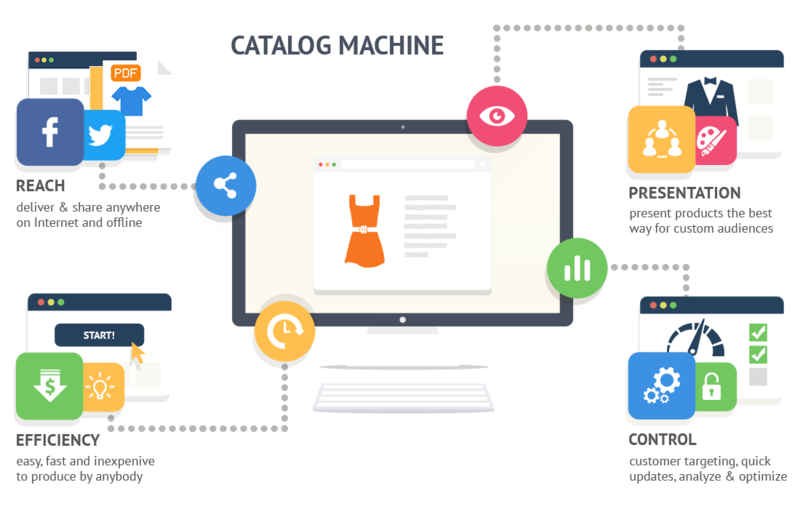 Build Online Product Catalogs for your Shopify, Etsy, eBay or Magento stores and boost your marketing power. 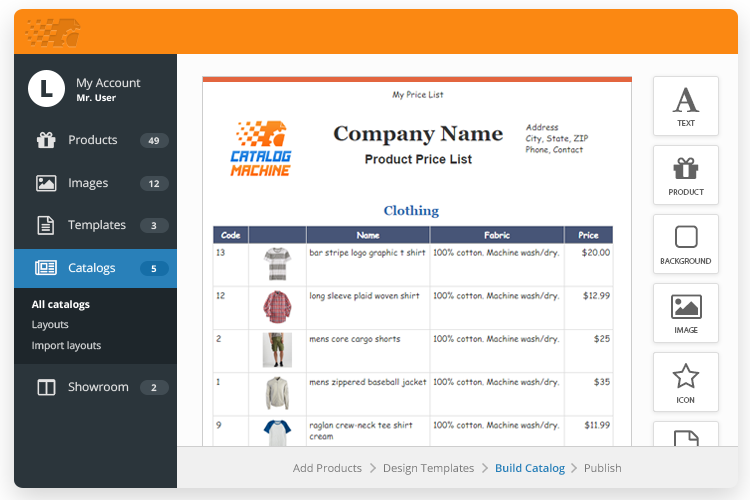 Use the Catalog Machine app to create, edit or import your products and images then quickly add them to your price list template. Extend with custom fields / variants / options including images, prices, barcodes, market description, specifications and more. Use price list templates and layouts to easily display your product prices, images and description, or create your own catalog design with the flexible product catalog maker. Complete your price list by adding custom text, images and marketing material or build your own pages for company, order information or terms of business, product guides, articles and more. Re-import or change your products in the Catalog Machine database with automatic update in your catalogs. Clone your price list versions and set privacy levels up to password protection. Share by email, social media as a price list URL, download or send as a PDF, embed to your site quickly and cleanly to make product marketing promotion painless. Build your price list and update products with your team in multi-user mode. Work as an agency with multiple accounts linked to your login. After searching and trailing various programs to produce a catalog, I found the gem that is Catalog Machine - simple to use and update and produces a very fast online catalog. The best features are that the pages and items can be modified easily and quickly, the drag and drop design feature is easy to use, the search facility is very accurate and quick, you can always print from pdf the latest catalog, catalogs load online very quickly twice as fast a flash catalogs, products are populated in google search engine and we get hits for no extra cost and the best feature of all is the technical support and fast response to problems. 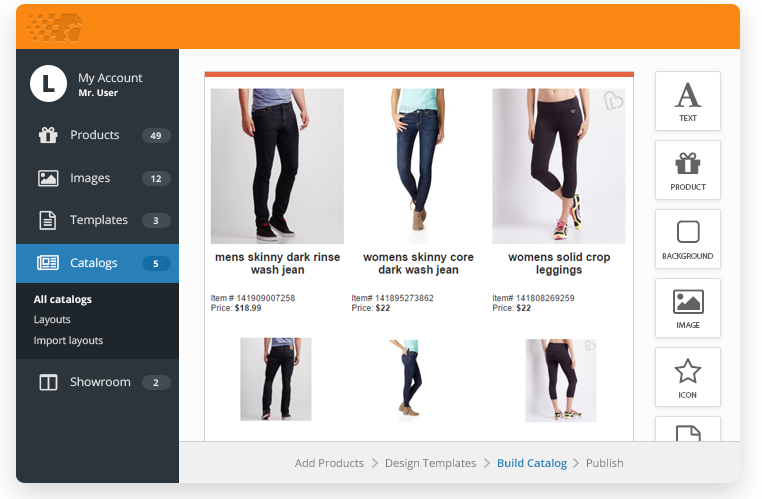 I love the templates and the flexibility that Catalog Machine has for creating catalogs. Most of all I love the support. I wanted to have a catalog that not only could be accessed from our website, but could be used as a training tool for our reps. Every detail about our products are in the catalog, making it easier for customers to learn as well, without searching an entire website to learn and what they might want to carry. We have approx 15 MG Dealerships that use the catalogue to show their potential customers the add-ons available on the new MG Cars. As a marketing tool they are invaluable. Before I found Catalog Machine I was producing a PDF and emailing it out to the dealers. Catalog Machine can be worked on live (behind the scenes) without the dealers knowing about it. Easily apply updates as I introduce new products and delete obsolete products. Enables ongoing marketing by sending updates to the catalog. Online Catalog Machine is a lower cost alternative to printing paper catalogs. My customers like and prefer online catalogs to paper catalogs. I didn’t need to hire a marketing specialist or a designer to create my catalogs. I was able to create and distribute my catalogs in a relatively short period of time. We looked at several options and chose Catalog Machine because it had everything we were looking for as a small business. It's flexible so that we can personalize the catalogs easily for our sales reps and brick-and-mortar retail clients. We chose the option with passcode protection, which we love! The catalog enables links to websites so that clients can easily find additional information, so it's tremendously flexible. We use it all the time! I was stuck and in a bad position when I found Catalog Machine. A manufacturer we dealt with promised one of our customers they would make a parts catalog for them, but never delivered. The customer kept calling and emailing me and asking when this catalog would be created and I had no answer. Eventually, I took it on myself to find a solution. The solutions I found were they were either expensive or difficult. When I found Catalog Machine, I was pleasantly surprised - within a weekend I was able to create a catalog that looked professional and my customer was happy with. It turned out so well, I created a parts catalog for our own company and linked it to our website. Catalog Machine enabled me to create a good looking parts catalog customers could browse through easily. I've had customers contact me from all over the United States to order parts, which has been a nice surprise. I use this catalog as a teaching tool for my customers. It enables their employees to look at pictures of various parts, so they can identify components on machinery that failed over the phone. We used to have our catalog in powerpoint presentation, then we moved to a photoshop version which exported to PDF. Any modification of pictures, descriptions, or pricing had to be done by our designer. That would usually take days and some back and forth changes until it could be sent to customers. Today, we do everything with Catalog Machine ourselves, the publishing is instant. The fact that we don’t send emails with PDF’s anymore has also helped, as we always use one link where the latest version of our catalog is published. The customer decides if he wants to view the catalog online, or to download a pdf copy. We have also control of how many times our catalog has been viewed or downloaded. The latest feature which we loved, was the showroom that was added to the catalog machine. We can now send a link to the showroom to our customers, and they can select the products they are interested in and request for pricing without trouble.